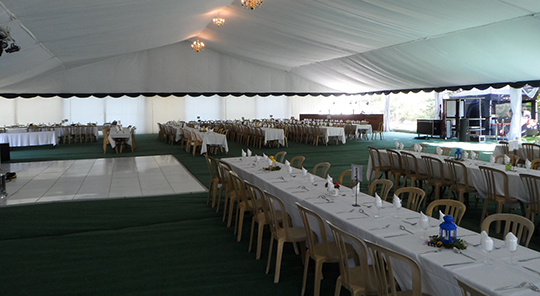 ABC Marquees have been the preferred supplier at Plumpton College, near Lewes in East Sussex, for over 10 years. The agricultural college recently held its annual awards ceremony in an extravagantly large marquee on their own premises, where over two thousand guests celebrated the awards and achievements of both students and staff. Alongside the marquee hire, the seated event required chairs and tables arranged in long banqueting-style rows, with marquee linings, green flooring and a white dance floor positioned in front of a small stage, with professional sound system and stage lighting. Four pretty Chandeliers along the ceiling of the marquee gave an ambient lighting effect for the evening ceremony and speeches. The marquee was also the venue for the college’s Summer Ball a few days later, for staff and students, with Dodgem cars right outside the marquee.